Each year, American Cancer Society researchers do a deep dive into cancer data to provide the most current information about cancer in the United States, including the projected numbers of new cancer cases and deaths. Below are 10 key numbers from the American Cancer Society’s 2014 Cancer Facts & Figures publication and Cancer Statistics article. All figures are for the U.S.
1,665,540: The number of new cancer cases expected to be diagnosed in 2014. 585,720: The number of Americans expected to die of cancer in 2014, about 1,600 people per day. 20%: The decline in the cancer death rate for men and women combined from 1991 to 2010. More than 1.3 million cancer deaths have been averted as a result of this decline. 159,260: Expected number of lung cancer deaths in 2014. More men and women die of lung cancer than any other type of cancer. Additionally, 116,000 men and 108,210 women are estimated to be diagnosed with lung and bronchus cancer in 2014. 30%: The percentage of all cancer deaths that can be attributed to smoking. Smoking remains the leading cause of preventable death worldwide. 232,670: Number of women expected to be diagnosed with invasive breast cancer in 2014; about 2,360 cases are expected in men. Breast cancer is the most frequently diagnosed cancer in women, with the exception of cancers of the skin. 233,000: Number of men expected to be diagnosed with prostate cancer in 2014 – the most frequently diagnosed cancer in men, aside from skin cancer. 136,830: Number of colorectal cancer cases expected to be diagnosed in 2014. Colorectal cancer is the third most common cancer in both men and women. 1 in 235: The number of children who will be diagnosed with cancer before age 20. A total of 15,780 new cancer cases are expected to be diagnosed in children and adolescents in 2014. $216.6 billion: The overall costs of cancer in 2009, according to the National Institutes of Health (NIH). 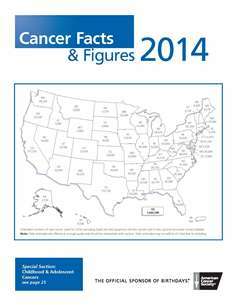 Explore these statistics and more in Cancer Facts & Figures 2014 and Cancer Statistics, 2014.